Having that extra -CH3 jutting out of the DNA could get in the way of proteins that bind DNA and direct gene activity. Scientists are just starting to figure out what enzymes affect this DNA modification in insects and mammals. Geneticists at Emory University School of Medicine led by Peng Jin, PhD have been studying a modification of DNA that is not well understood in animals: methylation of the DNA letter A (adenine). They've found that it appears more in the brain under conditions of stress, and may have a role in neuropsychiatric disorders. The results were published on Oct. 24 in Nature Communications. What if methylation appears on adenine? In bacteria, N6-methyladenine is part of how they defend themselves against invasion by phages (viruses that infect bacteria). The same modification was recently identified as present in the DNA of insects and mammals, but this epigenetic flourish has been awaiting a full explanation of its function. "We found that 6-methyl A is dynamic, which could suggest a functional role," Jin says. "That said, the enzymes that recognize, add and erase this type of DNA methylation are still mysterious." In the Nature Communications paper, Yao, Jin and their colleagues looked at the prefrontal cortex region of the brain in mice that were subjected to stress, in standard models for the study of depression (forced swim test and tail suspension test). Under these conditions, the abundance of N6-methyladenine in the brain cells' DNA rose four-fold, the scientists found. 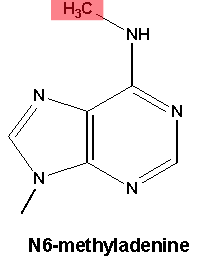 The DNA modification was detected with two sensitive techniques: liquid chromatography/mass spectrometry and binding to an antibody against N6-methyladenine. The peak abundance is about 25 parts per million, which isn't that high - but it appears to be confined to certain regions of the genome. The methyl-A modification tended to appear more in regions that were between genes and was mostly excluded from the parts of the genome that encode proteins. The loss of methyl-A correlates with genes that are upregulated with stress, suggesting that something removes it around active genes. There does seem to be some "cross talk" between A and C methylation, Jin adds. The research was supported in part by the National Institute of Neurological Disorders and Stroke (NS051630, NS097206) and the National Institute of Mental Health (MH102690).